One of the things I've needed for a few years is additional storage for wood so that's been on my workshop makeover punch-list from the beginning. My original plan was to put up walls in the smaller shop similar to how I'd put up walls in the larger shop. The walls are insulated with fiberglass batting backed by 1" closed cell foam board. I covered all that with 5/8" T1-11 plywood. I had leftover house paint so I painted it too. It took three or four coats but I figured it would be easier to keep dust free. It has worked out well. Having plywood covering all the walls means I can screw stuff to it where ever I want for lighter loads. It is also very durable and doesn't get dings and dents the way drywall or a lighter paneling might. As an added bonus it makes my workshop one of the most comfortable rooms in the house. It stays toasty warm in the winter and nice and cool in the summer. The one downside is that it is relatively expensive. I'm going to have to cover 45 linear feet of wall. That's 30-35 studs, 11 sheets of T1-11, 22 sheets of foam board, bottom plates, top plates, fiberglass insulation... That all adds up to hundreds of dollars, heck it's over $300 just for the T1-11. $100 in studs, etc. Then my wife got involved. I was discussing my options and thoughts with her and she asked, "Why are you putting up walls?" I thought about it for a little while and realized I was pretty happy working in the larger shop. With all my mobile tools moved out so I could build my workbench I found I really liked working in there when it wasn't cluttered. This is kind of the direction I was heading anyway; however, just being halfway there I'm already seeing the intended effects. I think I might want to try using just the larger shop for awhile and use the smaller shop for storage: tools, wood, etc. I want to build and start using a hand tool bench eventually. I'd like an assembly table too. When and if I make these they'll almost have to go into the smaller shop. I can re-evaluate my desire for walls at that point in time. And how is this all relevant to the wood storage issue? 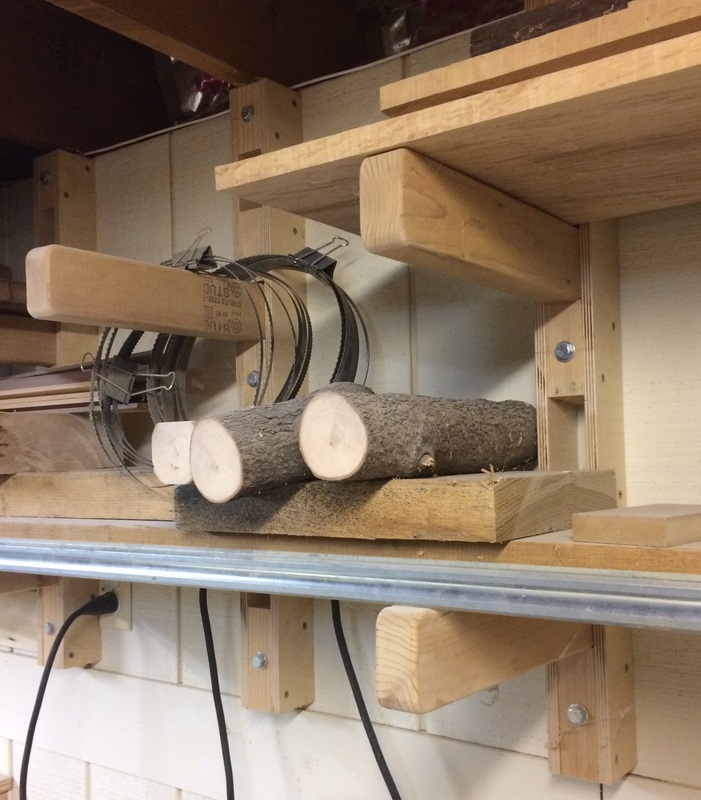 I'd been planning on building a larger version of the same wood storage racks I have in the larger shop. The issue is that my current wood storage rack design is wall mounted. The decision to not put up walls means I need a new plan for a wood storage rack. 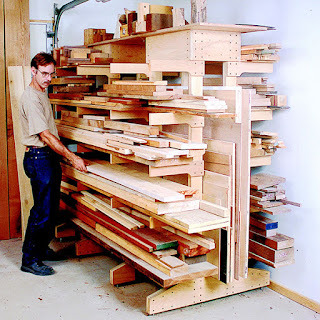 I started where I always start and looked through my personal magazine index for wood storage racks. I didn't find anything free standing so I went to my second choice which was googling for wood storage rack. I found a couple of likely examples; however, they were images from pintrest which never led me back to somewhere that had plans. I'm moving from ambivalent to hating pintrest. So when Google failed me I went to my third route which was to go to web sites for wood working magazines and doing searches in their indexes for plans. Why is this third in my list of choices? 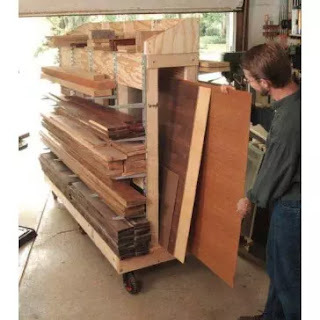 Because by and large wood working magazines are great at woodworking but tend to be much less adept at building websites and article search engines. The long and the short of this is that this approach failed me too. 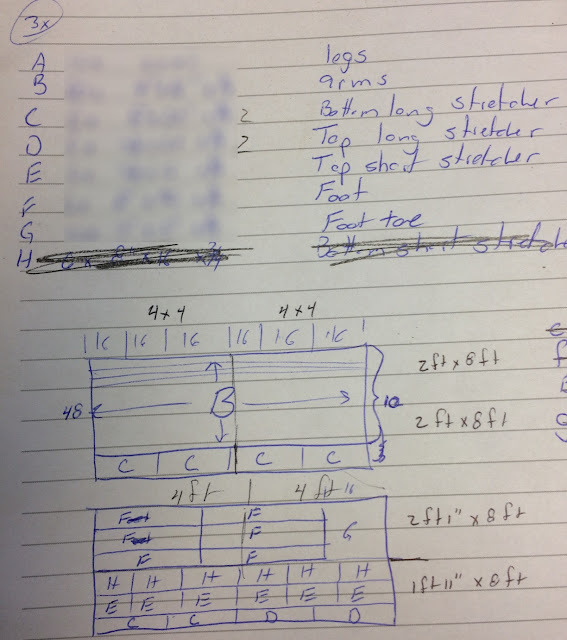 I did come across a set of plans in an old Woodworker's Journal. I did get that magazine for a couple of years but not the issue the plans were printed. They are offered for sale on Rockler's website but are $8. Then finally I found the plans for the wood rack I kept seeing pictures of on pintrest. And oddly enough I ran across them almost randomly. 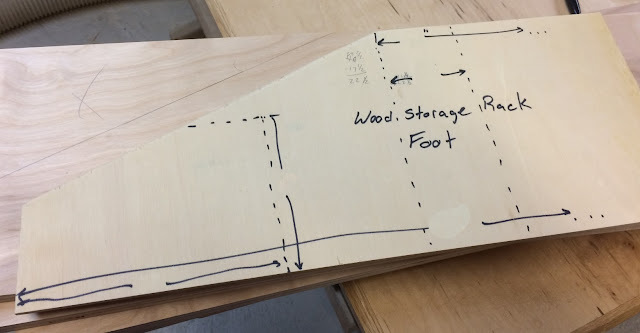 In my searching indexes on woodworking websites I came across a really cool hammock stand on the Wood Magazine website. After looking through those I decided to see what else they had and came across the plans I really wanted. Even better they're only $3. Whew! Are we ready to get into the build versus having to hear all the BS about walls versus no walls or the travails of trying to find plans versus designing my own storage? In short, no. An added complication this week is that on Wednesday we had a very large wind storm. Wind storm? Yes, a wind storm. This highest measured gust was 82 mph. This blew down trees, trees onto power lines, and just power lines. Approximately 40% of the county was without power. Me? I had power which is somewhat of a miracle. Every previous time our region had any kind of power outage, it invariably included my house and took a week to get power back. So why was this a complication? Only that even when a disaster doesn't strike you directly everything takes a little more time and a little more effort. Also a friend of mine did lose power so he was staying over a couple of nights while the temperature in his house dipped into the 30's. Also, no Internet! No Internet means no Netflix, HBO GO... GAH! And now? Onto the build. Okay, first the purchase of materials. The author of the plans used poplar for the posts; however, I decided to scrimp on the costs a little bit and use common 2x4s. To get the 2x4's I grabbed my battery operated Makita circular saw and ran to Home Depot first thing in the morning. To save a little money I bought 12ft 2x4s and cut them in half in the parking lot so they'd fit in the back of my Forrester. The stack of 12ft 2x4s was relatively heavily picked over so it took a while to dig though to find relatively straight boards. I also needed plywood for this and my next project so I called my friend - a fellow woodworker - 'John', who also owns a truck, and made arrangements to stop by my local lumber store. Picking up lumber always takes longer than I expect but I did have time for a quick trip to the grocery store before John called and said he was ready to meet me at the lumber store. The store didn't have power but they were still open. We just had to use flashlights to find our sheet goods. 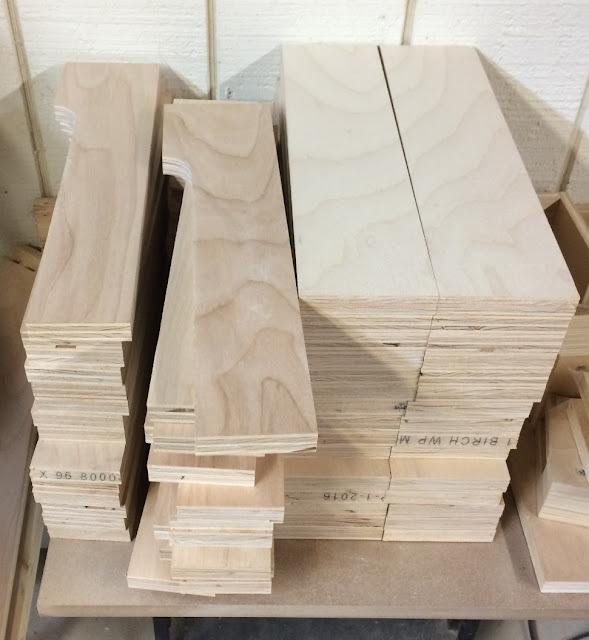 four sheets of 3/4" birch, one sheet of 1/2" D grade maple, one sheet of 3/4" MDF, and one sheet of 1/2" MDF. Enough for this project and the next. Thanks 'John'! After cooking lunch for my wife any myself I started breaking down the plywood. 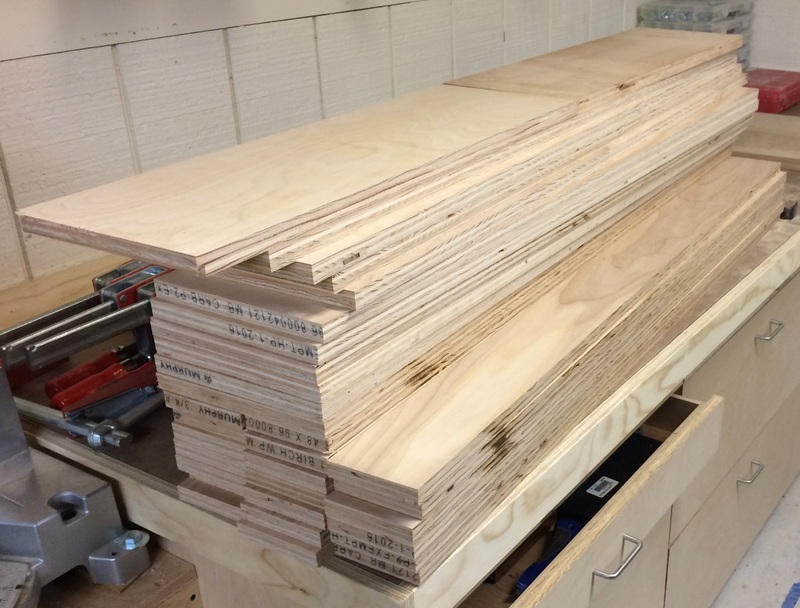 John and I'd unloaded the wood into my garage so to make it convenient to get the sheets into my basement I dropped them onto a couple of 2" thick foam boards and cut then into 4' x 4' sheets using my cordless circular saw. Half sheets are much easier to carry. I used the cutting diagrams I drawn up earlier in the week to break down the half sheets into rough parts. There's a lot of parts because I want to build three racks. The plans say that two racks can support up to 10 ft boards but I'd like to be able to support longer boards. I often buy 12 or 16 ft boards. I had to stop to make dinner last night but picked it all back up this afternoon. I started with the feet. 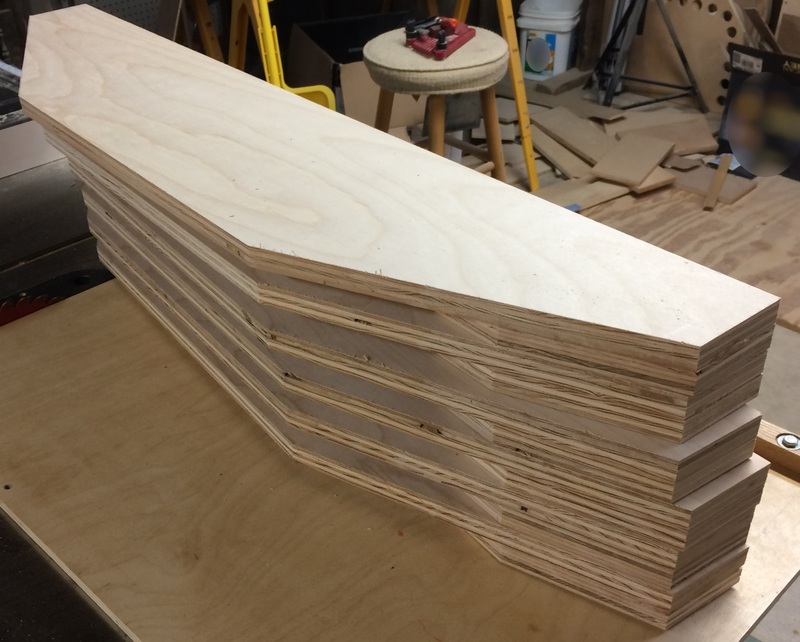 These get a second layer of plywood at the ends and get a bevel to lighten them up. Rather than measuring each one I made a template so I could just trace each foot. I considered a few different options for cutting the bevel but settled on using my circular saw. It cuts straight and clean and I don't need fancy jigs. Also, I don't need super awesome precision. I started by gluing the - ummm, I'm calling them toes - to the feet. I used a simple jig which amounted to a straight edge to keep the bottoms flush while I tacked them together with brad nails. The nails held everything in place so I could drill pilot holes and then add deck screws. It all went surprisingly smoothly. The plans don't have a diagram or even measurements for the arms so I made some educated guesses and used my advanced math skills. Using a compass and ruler I laid out one arm and then after cleaning it up with my spindle sander and sanding block I used it to trace the pattern on the other arms. I got about halfway through before needing to stop to clean up so I could make dinner. I was hoping to get everything done this weekend but I just didn't get enough workshop hours. There's 30 arms left and then assembly of all the bits but hopefully I can get it all done this week and maybe a little into next weekend.